The Onion is a free Windows 8 News Reader App that provides you with the most reliable, unaltered news from America. It’s the official client app of The Onion – America’s finest source of news. You get the option to browse through the News using different categories. Apart from this, you can even browse through the Videos section for Video coverage by The Onion. Let’s take a deeper look at this Free Windows 8 News Reader App. You can browse through the news right from your main screen using this free Windows 8 News Reader App. As you open the app, news will appear in front of you in form of tiles categorized as Latest, Videos, Sports, and Images. In these sections you will get all the related news. You just have to choose the appropriate news from among the appearing articles and the article will open up with one click. The app provides you with the capability to search for a topic in general. If you want to search for a particular topic and want all related news for that, then you can search for it. Search using a topic or phrase using the Windows 8 Search Charm and all related articles will appear in front of you. This is particularly useful for research purposes. As mentioned earlier, the app also shows images and video coverage of the news. The videos are in HD format and the images are all in high-quality. The Videos section provides you entire coverage on that news from The Onion in form of videos . The Image section will give you the illustrated Images, right from The Onion. You just have to select the appropriate topic that’s it. Apart from that, there’s a top flyout that appears when you right-click anywhere on the app’s screen. This flyout contains options to view the latest news, sports news, all videos, or images in one click. The home button on this flyout takes you back to the home screen from any of the screens you are currently on. Also check out other news reading apps reviewed earlier by us: BBC News Mobile, Sports Illustrated, Sports Republic, Earthquakes 101. Nice User-Interface: The user-interface is quite nice and you can easily understand the working of the app. Tiled appearance: All news will appear as tiles on the main screen. Just click on the appropriate tile and the entire article will appear in front of you. Finest, Reliable, and unaltered news from America: Official app from Windows 8, provides you with news from the most reliable news source- The Onion. Watch videos: Watch the exclusive news coverage from The Onion in the video section. Integrated with Search Charm: You have the capability to search on a particular topic using the Windows 8 search charm. Just search by using a keyword or phrase and a number of articles related to that topic will appear right in front of you. Smooth transition: The transition among articles is quite smooth and praiseworthy. To conclude, I would like to say that the app is quite good to use. It has a good user interface. News are provided directly from The Onion which is quite a reliable and unbiased source of news. 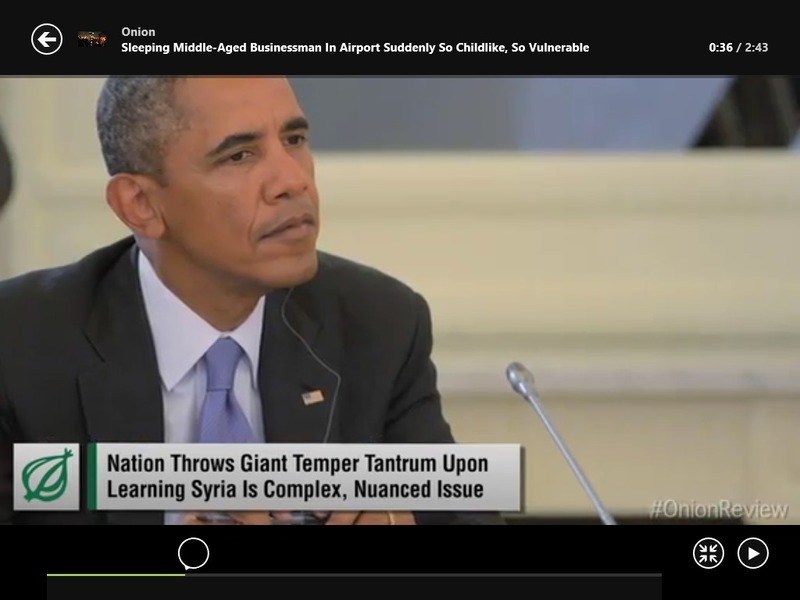 The Videos category allows you to search for video-coverage by The Onion which is quite good. Transition is good, you can smoothly get from one article to another. Also, the feature to search on a particular topic is worth noticing. All in all, The Onion is worth a try. Get The Onion from Windows 8 from here.